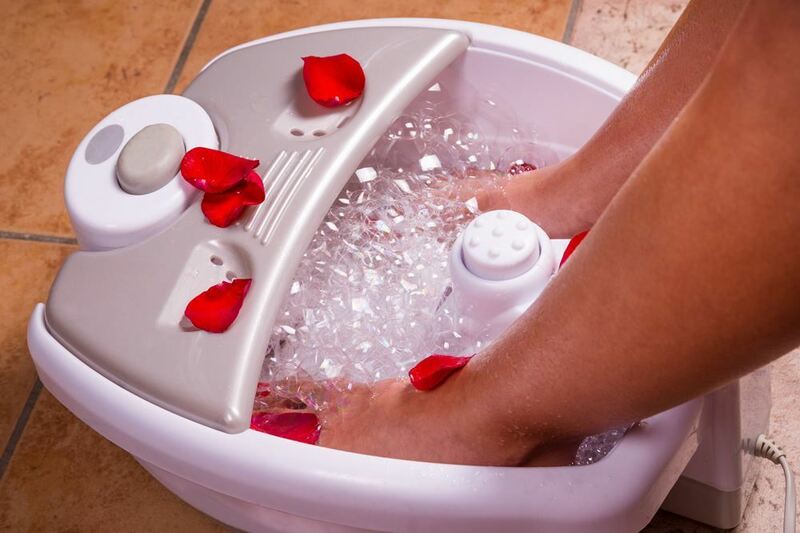 Technology has wonderfully given us effective and convenient ways to relax and one of these is a home foot spa device. While these devices can technically provide 10 to 20 minutes of bliss, sometimes it can be difficult to reach a sense of Zen when all you hear is noise loud enough that can be heard in the next room or shake the nails out of the floorboards. Below are some of the durable foot spas in the market today that are not only effective but also amazingly quiet. 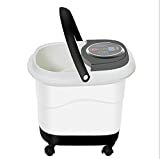 At first glance of this product, you will know you will have an enjoyable experience from its splash-free design, eye-catching color, smart technology and not to mention quiet motor. It comes with a bubble feature and nice little vibrations that help ease the tension from tight muscles. The bubbles pleasantly come in a relaxing fashion and not like the water jet approach usually found from the other manufacturers. This foot spa device also comes with a rolling massager which you can run over specific parts of your foot. It comes in a splash-free design to prevent messy spills and leaks, as well as a removable pumice stone which helps in exfoliating dead skin cells away from your heels, soles and ankle area. 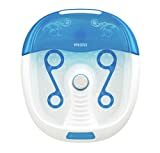 In addition to the quiet motor, this device includes a set of pedicure accessories so you can follow your foot spa session with a good pedicure, leaving you with a pair of feet that feel and look beautiful. This foot spa has garnered a lot of positive feedback from customers because of these benefits at a tag price friendly on the budget. After the hectic schedule of our day, nothing beats a quick soak in a foot tub. 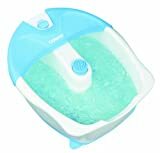 The Conair Bubbling Foot Spa is another great option to provide your feet with quick relaxation. Similar to Dr. Scholl’s, the Conair includes smart heat technology which maintains the warmth of the water throughout your soak so you won’t need to reheat the water after 10 minutes. It also comes with bubbles, pedicure attachments comprising a pumice, brush and a massage plug-rest that includes two-foot rollers on each side. Probably the selling factor of this machine is its LED blue light on each side that creates a relaxing setting and its waterfall feature that aids in creating a soothing and relaxing experience. Not only do the full bubble action and the creative waterfall massages combine to give you a luxurious pampering experience, but also the quiet motor this device adds to it. For a price within the same price range of Dr. Scholl’s, you can reap the benefits of a nice foot spa with your feet and wallet thanking you. If you are someone who takes regular trips to the spa, you may have noticed a peak in your expenses resulting from these expensive visits. With HoMedics Foot Spa, you can experience the same fantastic relaxation after a few minute session without having to spend a chunk of your savings. HoMedics Foot Spa features a 2-in-1 experience which combines the calming bubble massage and rejuvenating water jets. 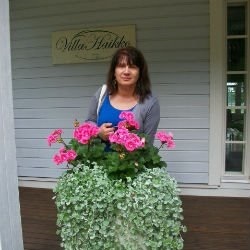 It is also designed to have a deep basin and a splash-free design to reduce water spills. Similar to Dr. Scholl’s and Conair, HoMedics include three attachments of pumice stone, cleansing brush, and a massage roller so you can give yourself little massages and exfoliate dry skin and callouses. 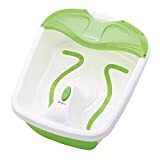 In addition to these features, this foot spa device comes with a quiet motor that deserves to be tried on your exhausted feet. The Aqua-Jet Foot Spa is one of the foot spas in the market that has garnered a relatively large amount of positive feedback from customers, and it leaves no room to wonder why. With its built-in heat, adjustable speeds, rotating jets and much more, it will give you a great overall foot spa experience. Many of the foot spa devices on the market today are appealing to the eye; however, most have sizes not large enough to fit a size 11 foot. This device is fairly large enough to allow your feet to move comfortably and leave some more room for your extremities to move around. 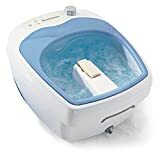 One of the competitive features of this Aqua-Jet Foot Spa is that it allows you to customize your foot spa experience through its adjustable speeds and rotating jets. It also heats water instantly so you don’t need to wait for a long time to soak your feet. With its brilliant features, quiet motor and an average tag price, this foot spa will surely give you a good bang for the buck. In the industry dominated by budget-friendly foot spa machines, there are a few brands in the expensive end of the spectrum that does not disappoint. The T-Day, for example, boasts of a limited noise and features a variety of functions such as a bubble massager and vibration therapy, a removable roller attachment that soothes tired feet, and sixteen integrated magnets that provide a magnetic field therapy. Additional features include infrared light therapy, heating at five levels and an LED display. While the cheaper brands are reported to malfunction after several uses, this model is designed with a solid construction to last you for an extended number of uses. 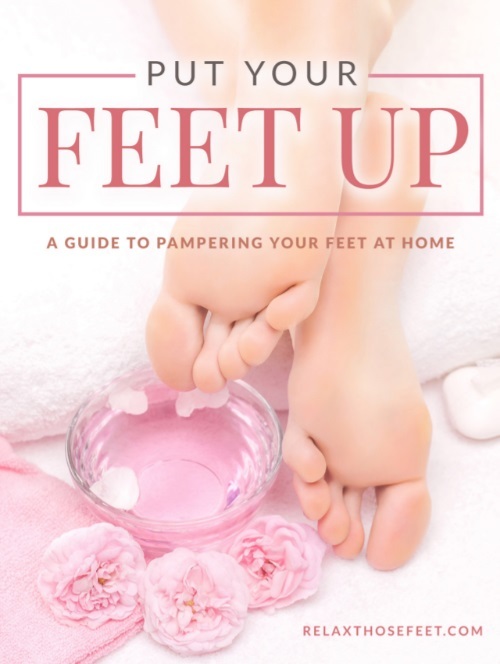 With any of the above quietest foot spa options, you can strike a balance between your professional and personal life by giving yourself a few minutes to pamper your weary feet after a long and tiring day. With the warm water surrounding your feet without the loud noise that almost sounds like a car engine, you are bound to reach a sense of relaxation and release yourself from fatigue, stress, and anxiety.